Why do you need a right seat cushion? A right cushion helps you effectively relief pains. If you spend a lot of time driving and sitting, this tailbone cushion is the suitable choice. Our orthopedic memory foam seat cushion is perfect for pain relief of tailbone, sciatica, tailbone, back and spine pains, lumbar pain, Pelvic pressure and hip pain, lumbosacral spondylosis,sacrum sacroiliitis, prostate conditions etc. This chair pad is suitable for office chair, car seat, wheelchair, any home chair or seat on a bus, airplane or train. And it suitable for drivers, teachers, students, people with wheelchair, pregnant women, office workers etc. 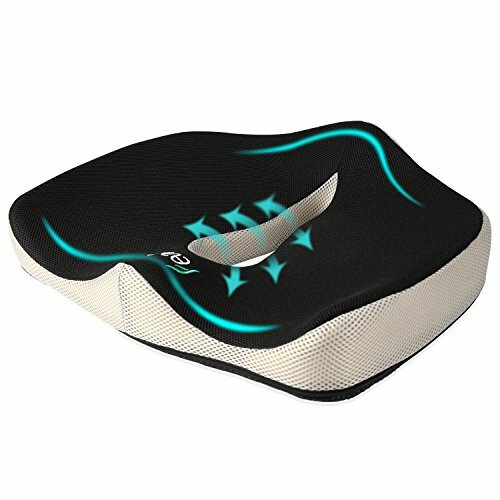 The Feagar Coccyx seat pillow Measuring just 24.5 ounces with dimensions of 17.72*14.96*5.12 inches, it is convenient to take it with you anywhere. ERGONOMIC DESIGN: If you spend a lot of time driving and sitting, this seat cushion will gives you the support and relief you pains. Our car seat cushion is perfect for pain relief of sciatica, lower back pain, lumbar pain, Pelvic pressure and hip pain, lumbosacral spondylosis,sacrum sacroiliitis, prostate conditions etc. BREATHABLE HOLLOW : The Feagar office chair cushion with hollow design breathes well, It's the best choice for people with hemorrhoids, prostatitis problem and pregnant women. UNIQUE TAILBONE PROTECTION: The Feagar Coccyx seat cushion with heightened end,gently aligns the tailbone and distributes your weight evenly. High QUALITY: Unlike a lot of cushions that use gel, layers, and other ineffective budget materials, Feagar orthopedic memory foam chair pads use thick, high density memory foam that can keep its shape, feel soft and comfortable.Since it's temperature sense memory foam, it's normal that cushions become harder in low temperature, cushion softness will be adjusted by user or environment temperature, thus it can give good support and perfects posture well. WIDE RANGE APPLICATION: This seat pillow is suitable for computer chair, car seat, wheelchair, any home chair or seat on a bus, airplane or train. And it suitable for drivers, teachers, students, people with wheelchair, pregnant women, office workers etc. View More In Lifting Cushions. If you have any questions about this product by Feagar, contact us by completing and submitting the form below. If you are looking for a specif part number, please include it with your message.